After several weeks with no signs of mice, they are back. They are back and being caught mostly under the kitchen sink. To date (as of Sunday morning) we have caught 28. That is right 28 mice have been caught in by mix of methods including a humane and not humane traps, and Hailey. I also don't think I have missed my cats more. Stop sleeping and get hunting! The Man wonders if one that was caught in the humane trap is a repeat customer as it had a distinctive knobby tail. He is now taking them even further way. Yes, the mice are now going for a drive before being released. This is the service we offer here at our Mouse B and B. We have one idea where they may be coming in and have sealed this off. We will see if this helps. We couldn't seal it earlier because we think they are coming in the basement garage door and needed to be able to get into it until recently. Now it can be closed for the winter. I am actually looking forward to when the snow comes so we can take a look around the house for mouse tracks and see if we can find them around the house and determine where the suckers are coming in. Let's hope we are near the end of them soon. At this point I feel like saying "hobbies include, cleaning up mouse poop". At least they haven't gotten into the food cupboard and the only damage was the hose to the dishwasher. We got our first snow that stayed for 2 days this week. It is gone now, thank goodness! Don't forget to send your pictures for our Festival of Lights. See the details HERE. Feel free to be creative. No one who sends a photo will be left out! The comments have been counted and by a slim margin Wounded Warriors - PTSD service dogs program has won. Don't worry, we have something planned for the Cat Rescue Network later this month . . . details to follow! In the end both will win in different ways. Confessions of a Dog Lady - I Bought Junk Food. Last weekend, in all the chaos, I ran out of soft food for the dogs. They get a big table spoon with both meals. They both turn up their nose at dinner without it. The closest pet store that would have been open on Sunday was an hour away. I also knew looking at my schedule, I wasn't going to have time to get to the pet store until Thursday. (There is one 5 minutes from where I work part-time). While I pride myself on feeding the dogs high quality food, I made the decision to just get 2 cans of junk food from the grocery store. I knew this would get us through until Thursday. I plan on getting rid of what is left once the good food enters the house. I feel bad about it, but am sure for a few meals, they will live. 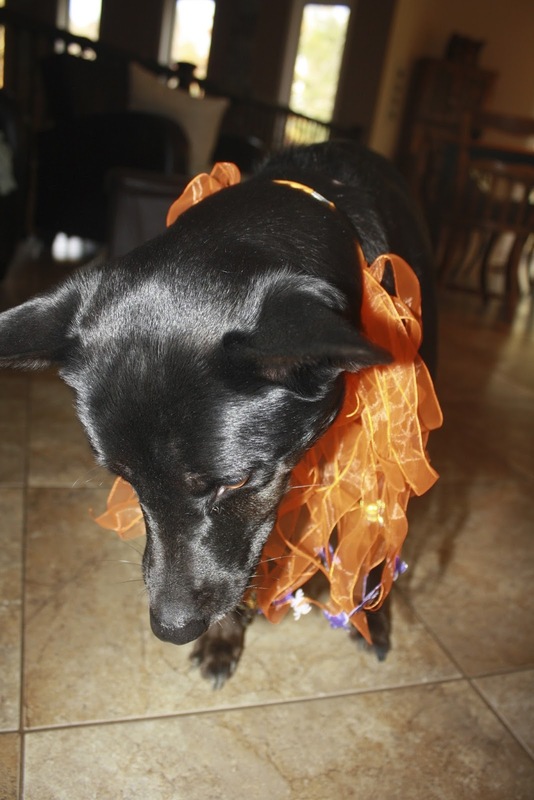 Have you ever been in a bind when it comes to pet food? Don't forget to send a picture of your celebration of lights to us at leeandphodATbell.net. We will announce the charity winner tomorrow! 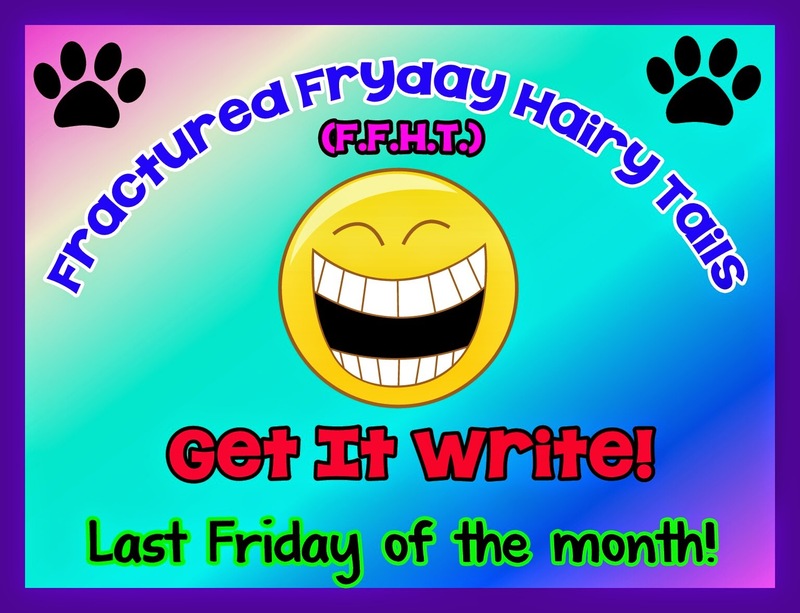 It is the last Friday of the month - that means it is time for Murphy and Stanley's FFHT. After I ate all that turkey, I curled up in front of the fire and dreamed of my boyfriend Easy. In my dream we went hunting and caught one of the wild turkeys I see every morning on my walk. We would make a great hunting team. We are both lean and great at reading things. Those turkeys wouldn't stand a chance. First, thank you all for your support for our upcoming event. You can read about it HERE. Some people have mentioned they don't have holiday lights. We ask you to be creative! Secondly, Hailey was not impressed with me dancing in the kitchen, this is the unimpressed look I got. She stood with her ears like that. I think the judges on the dancing reality show are nicer! Happy Birthday to the Big Guy! We love you! Happy Thanksgiving to all our American Pals! We are thrilled to be participating in our first shopping around the world, brought to you by Bacon and Fozzie. This months theme was 5 ingredients for a Thanksgiving Dinner. While we Canadian dogs celebrated in October, we thought we could still share the prices of some of our favourite Thanksgiving food. First we have the best part - the Turkey - unfortunately Lady won't let us catch one, so we have to buy one. Turkey was $3.28 a kg. What turkey is complete without the stuffing. Cause the Lady can't eat gluten a loaf of her gluten free bread is $6.49. Highway robbery is you ask her. Next up is the sweet potatoes. These are a new favourite in our house. They will set you back $1.29 a kg. What meal isn't complete with something green. The beans were $6.15 a kg. We are not pumpkin pie eaters in our house, we are apple pie ones. Macintosh apples were $4.99 a lb. Don't ask why they were sold by the pound in Canada. It is one of those mysteries, especially since they were products of Canada. Thanks for shopping with us in rural Quebec, Canada. We hope all our American pals enjoy their Thanksgiving! 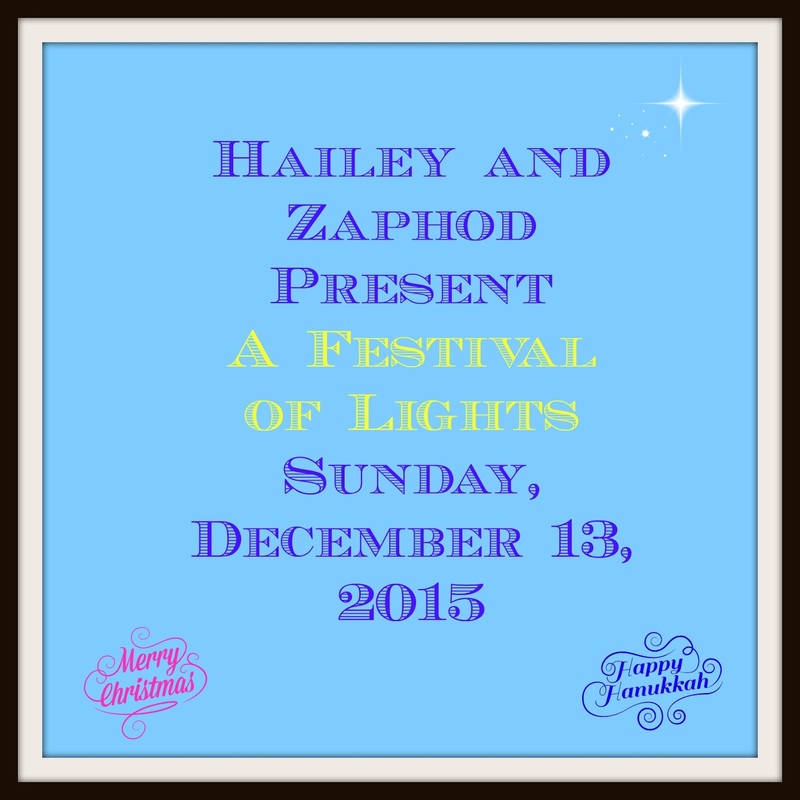 We are inviting all our pals to join us on Sunday, December 13, 2015 for our first festival of lights. 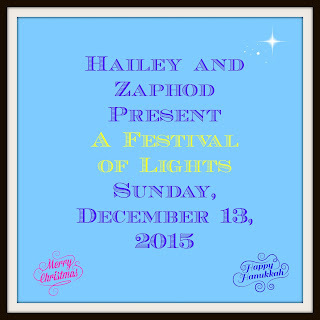 To participate please send a picture of your festival of lights to leeandphodATbellDOTnet no later than Friday, December 11, 2015. 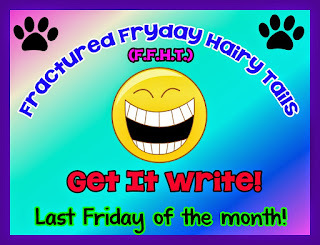 Please include you name(s) and your blog address. 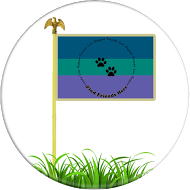 For each participant we are going to make $1 donation to an animal related charity. I have it narrowed down to 2. Both are very meaningful to me, so I am having an very hard time deciding. I am going to ask you all to help me pick. Please leave a comment about what charity you think we should support in this fundraiser. The charity with the most votes by whatever time I get to counting them on Saturday, will win. Please feel free to spread the word and thanks for participating! As last week was mischief week, we are replacing our regular Mischief Monday post with a good news one. First, the Man is on the mend. He has stopped being sick and his body is recovering. We did a really good job at taking care of him. Lady even managed to cook so she didn't starve. (Note, we were only allowed in the guest room with him for a bit as some doggy likes to pee on the beds in there). Second, the Lady (knock on wood) did get sick, which makes Man think he had food poisoning. This has us all happier than you can imagine. She is a worse patient then she is a nurse (which is hard to believe she can be worse at something once you see her nursing skills). Third, some good news about Grandmother. Being pragmatic asked her doctor the short and long term prognosis. She asked the doctor what she should prepare for. She has book club in 10 days, a great-grandchild coming in the spring and a grandchild getting married Labour Day. The doctor told her not to plan to attend book club (it appears she has pneumonia) but sees no reason why she won't be able to celebrate with her family next year. Thank you all for your POTP. The week is starting better than it ended, so we are cautiously optimistic. Thank you all for your kind words yesterday. The Man was very, very ill on Friday night (it was coming out of both ends) and he woke me up at 5:40 am Saturday morning because when he went to the bathroom to get some medication he fainted. He came to lying on the bathroom floor. Fortunately he was not injured. I am not the kindest most patient nurse at the best of times, but take my sleep away and well . . . . I tried to be as sympathetic as I could. I got him up. I got some food and fluids in him. I put him back to bed. When I took the dogs for a nice, if not brisk walk, later in the morning, I found myself laughing out loud. None of the things that happened are funny. But the fact they all happened in less than 24 hours is funny - the universe is just ridiculous sometimes. Besides I recently learned that people who can still laugh when faced with adversity are more resilient. As for my career, it is tough when you are dealing with serious and sometimes dangerous problem behaviours. It is not my favourite part of my job. I am lucky I haven't been seriously injured. In the moment I can stay pretty cool, after I have a brief period of being angry/frustrated/grossed out, but I pretty much move to "how can we change this." The young man in questions, is profoundly disabled. That doesn't make it ok, but it does make it my job. My job is to change behaviour. . That will be my focus and I will keep at it as long as needed. Yes, the successes make all the pain worthwhile and when we are successful at helping this young man, it will be extra wonderful! And no matter how my day goes, either personally or professionally, I have some great love waiting for me at home. Here is to a very uneventful week! Before going over the recap of my least favourite week this year, I will remind everyone what I do for a living (as it is relevant). I work with individuals with autism. In some cases severe autism. The individuals I am working with are 3-21 currently. -Thursday - a 19 year old became aggressive when I wouldn't let him smash a glass door (I know, I am so unreasonable) and spit repeatedly in my face (I would rather get hit any day then get spat on), hit me and shoved me repeatedly against the door. My back was pretty sore Thursday night, but better Friday. -Friday - we got terrible news. 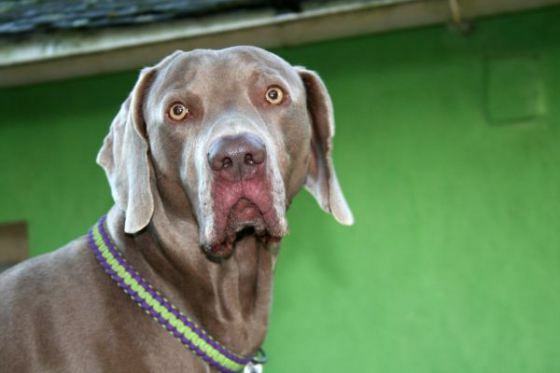 First, my parents beloved dog Barley, was diagnosed with a tumour in his stomach. He will be kept comfortable and given a lot of love as surgery is not an option that will change the outcome. Secondly, my 93 year old Grandmother had what they believe was a mild heart attack, and was diagnosed with congestive heart failure. She will require oxygen from now on. Then the Man came home with a stomach bug he got from a 2 year old on Wednesday. (He will be fine, but Lady will be grumpy if she gets it). I ask for some POTP for Barley and Grandmother. May they both be comfortable and not suffer needlessly. I have a terrible story to tell. Wednesday, the Lady was gone forever and ever. I thought she was never coming home. She was very late. (Editor's note - Lady was home by 6:30). I was so worried. It was dark. Man is usually home first, but on Wednesdays he doesn't come home until very late. As a special treat because I was so brave and waited so nicely, Lady let me play with Precious (my ball) in the driveway. My people are very mean and don't usually let me play when it is dark. It was going nicely until Lady was a Trickster and lost it. I couldn't find it. We looked and she then tricked me inside. I thought she had Precious inside and went to look. Once inside she tried to distract me but I kept searching for it. Finally, I knew I would have to wait until morning. Thursday morning she presented a ball. It may look like Precious to her, but I knew it was different. I wouldn't take it out. I searched and searched but couldn't find my Precious. Finally, I played with this new ball. I showed Lady it wasn't Precious as I refused to bring it in. She can't trick me. I am hoping my Precious still turns up, but until then will settle for ball. From the summer - as Lady doesn't have a new picture. (Sorry we didn't get to see everyone yesterday, Lady had a rough day at work which required a big Martini and a hot bath). This week has been so full of mischief so far, we can't even wait until Monday to tell you. I have had nothing to do with the mischief so I will report it. It started after the traitor Lady returned on Sunday. The house was peaceful and then suddenly there were people climbing up our roof. We barked and barked and barked and barked. The Man went out and up the roof too. We had to bark for 20 minutes. Then the people got off the roof and the evil ladder left. Then on Tuesday morning as Lady was about to leave for work, we all heard a rattling under the sink. Lady like a complete wimp bravely opened the cupboard and saw it was full of mouse poop. She was sort of brave when she set the trap. She let the Man know. All day we heard them. 2 mice were caught in the trap and one was in the humane trap. When Man opened the cupboard we could see them. We weren't allowed to have mouse appetizers for dinner. That is just not fair. In the evening another mouse was captured in the humane trap and by morning a 5th in the humane trap. This brings our mouse total to 22. 2 of those I am very proud to report I caught. There is even more mischief, but Phod wants to tell it, so we will save it for another day. Why is Phod so happy? Phod, loves, loves, loves to be brushed and after reading all your wonderful reviews, I, the Lady bought him a FURminator. I bought the medium sized one so that it wasn't too big to use on Hailey (who hates to be brushed) and because it was $30 less than the largest one. I figured I could do a little more work to save the money. Phod loves it. He comes prancing over when he sees me get it. He will let me brush him for about 15 minutes before he has had enough. The amount of fur you get out of this compared to a regular bush is amazing. I am working on getting long 2 brushes a week in for him and am hoping to see the difference on the floor. Phod is our German Shedder after all! Thanks to everyone who reviewed this and shared their opinion. I was hesitant to spend so much on a brush (it was about $44 Canadian plus taxes) that I wasn't sure would make such a difference. But it does and it was worth it. Phod gives it 4 paws up! He is looking forward to being brushed again soon! Mischief Monday - This Week's Winner Is . . .
First, she gets a big fat X for not going to PetExpo. She went somewhere Friday and came home with this bag that looks promising, but she promptly put it in a cupboard and said we have to wait for Hanukkah or Christmas. Sigh! Next she left the house on Saturday night with a suitcase. She left us alone with the Man (which we will pretend is horrible and that he didn't feed us, or love us, or takes us out, or make a wonderful fire to sleep by or anything). She came back Sunday morning and she smelt like other dogs. She was a traitor! We found other proof on her phone. Look carefully you can see a paw at the back, that is Rex and then Pugsley on her feet. Then Pugsley on her feet and Rex on Pugsley's head. We really wish Frankie and Ernie were around so we could take her to court! The events that occurred in Paris last night are horrible. I am sending my thoughts to all those affected by these terrible acts. I know the French are strong and resilient, and will overcome this. I hope that Hailey's boyfriend Easy's family and friends are safe. I dream of some day living in a world were this type of thing just doesn't happen. Hailey: "Phod, the Lady has found a new way to neglect us." Phod: "I can't imagine our Lady every neglecting us, she is so awesome." Hailey: "She really has this time." Phod: "What has she done?" Hailey: "I saw on the Twitter it is PetExpo this weekend and when I asked her, she said she wasn't going." Phod: "That means she will be staying home with us." Hailey: "What that means is that we won't get all kinds of pawsome treats and toys. Remember all the stuff she has brought home the last two years. She said we have a cupboard full of stuff and she will buy what we need. She says it is a better reflection of her now more mindful lifestyle. I think it is a load of crap." Phod: "I have a Precious, enough to eat, I get a greenie every day and when the Lady gives you a pill, I get a cookie. I can't imagine needing more." Hailey: "Oh Phod, you are not going to help me make her feel guilty are you." Phod: "Sorry Hailey, I won't." Hailey: "I am going to find something to pee on to teach her a lesson." P.S. It is your last weekend to get on the Christmas Card List and to join up for the gift exchange. Click HERE and you will be sent to Oreo's blog to learn all about it. In our house, you can determine the seasons by Hailey's sleeping position on the bed. In the warmer spring and fall weather, she sleeps at the bottom of the bed. In the hottest summer weather, she prefers a bed on the floor. In the cold weather, she likes to sleep curled up between our knees or up by our chests. She needs to be touching us. This past week, the temperature has dropped. Our bedroom has been about 16 C/60 F (which I the Lady think is perfect sleeping temperatures, but I tend to get very hot in my sleep). Hailey has slept mostly curled up on or by my legs. However, on Tuesday night, she spent some of the night up higher, more chest level and she wrapped her paw around my arm. It was so sweet. I really wanted to roll over but couldn't bring myself to disturb her. Phod still mostly sleeps on the floor (on a dog bed) although occasionally he will join us on the bed. Today, we pause to give thanks to the men, women and animals, who have and are serving in the Canadian forces and with our allies. Years ago, I was visiting my father's parents. Gramps, was a WWII veteran. His father had been a POW in WWI. Grandmother's father had fought in the trenches in WWI and had been gassed. Over breakfast, my grandparents had a debate as to which of their fathers had a harder time at war. They were each supporting the others father. Although I was never asked my opinion, I would have sided with Gramps, and go with the trenches being the worst. He after all was the one with the first hand knowledge of war. It was one of the few times that a discussion of the conditions of war happened in my presence. Not that I blame survivors for not wanting to share horrors that are beyond most of our imaginations. However, with so many veterans lost to old age (including my Gramps), I worry that the stories and lessons from those horrific times will be lost with them. More recent conflicts have not had the huge societal impact that WWI and WWII had. Those without family members or friends directly involved in the recent conflicts, were able to "ignore" these conflicts in a way those facing shortages, daily casualty lists, etc. during the World Wars couldn't. We will use this day, to thank all who serviced and as a reminder to keep history alive, in hopes of producing a better, more peaceful world. Because at the end of the day, that is what all the sacrifices were for. It is gone and he hasn't been licking it. We wonder if he just got a scratch in the bush that hurt for a day or two. We are just glad he is better. Phod has a new habit. With the days getting shorter, it is getting dark on some of our morning walks. Normally when we are walking, both dogs are out in front. However, if it is dark, Hailey is out in front and Phody is either beside me or slightly behind me. He doesn't feel as confident in the dark. This is fine except sometimes he tries to cross behind me and be on the other side and then we end up all tangled. Hailey gets annoyed when we have to stop and untangle. Perhaps he will get use to the darkness. Mischief Monday - What a Day! Last Wednesday wins the mischief day! It started with Man realizing as he was leaving for work that he had a flat tire. Fortunately, Lady was working from home, so he could take her car. Lady dealt with having CAA come and put the donut on. We were very mad that we had to stay in the house while Lady was outside with a stranger. We barked the whole time. Lady said it was amusing because the guy who came to deal with the car only spoke French and Lady doesn't really speak French, so she really had no idea what he was saying. Then, after dinner, Lady thought Phod was playing in the bedroom. She went in to discover he had gone into the laundry hamper, taken out underwear and chewed up 2 pairs of her underwear and one of the Man's. She didn't take a picture of that to spare you all. However, she took a picture of shameful Phod. He sulked all night after being scolded. The closet door now needs to stay closed so he can't eat underwear. Did you hear? I, Hailey, have a boyfriend! It is Easy! He is handsome, he has shiny fur, he lives in France (French boyfriends are highly coveted. Lady tells Man if he dies, she is replacing him with one), and he is crazy unique and his own dog like I am. I think we will be the perfect couple, as long as he can keep up with me! Getting ready to FaceTime with him, is my fur ok? Earlier this week we talked about how well Hailey did with the wind storm. I hadn't really been home during the day to get a good picture of the top of the tree that fell. Here it is. The tree on the left is where it fell from. Lady and Man (and the bank) own 3 acres of land. About 1 and bit acre is the house and lawn and driveway. The rest is woods. In the summer, when the brush is thick, we don't go into the woods much. Lady keeps saying they will clear a path or two, we will believe her when . . . . Anyway, now that things are dying, we get to walk in it. This week has been amazing. While it has been near 0C in the morning, the afternoons have been warm 18C/65F. This is at least 10 degrees C warmer than usual. We have been loving it! Lady says it is a tough walk because Hailey and she always go opposite ways around trees. So far, Phod hasn't lost Precious in the bush. Lady pays extra close attention to where she throws it. See the house they are building at the end of the road? We can sneak up and look at it. Such great places to sniff and smell and roll. And if we are fast, we can sneak some deer poop for a snack! No only did our people spend Halloween night with our human cousin, they spent time with our cat cousins, Lupul and Panda. We think it is completely unfair that they got to have cat time, when we so very much miss having a cat. Sigh! 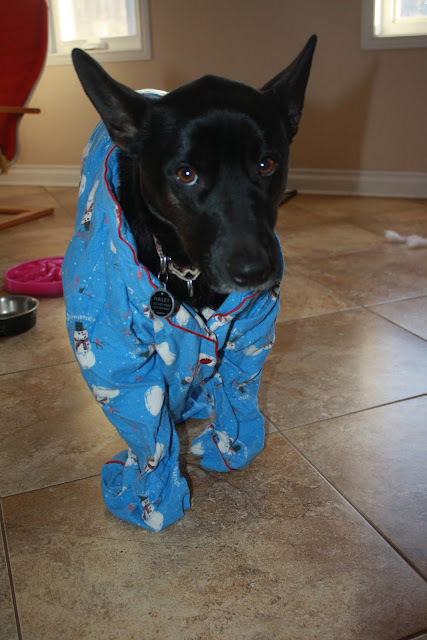 Wordless Wednesday - Are We Done Yet? 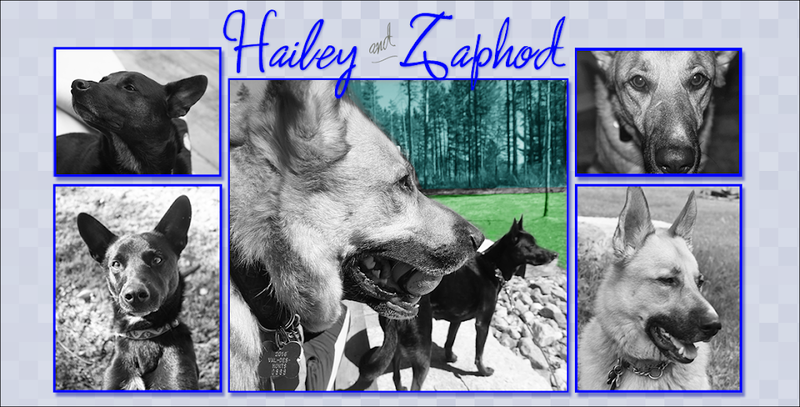 It has been a while since I have given an update on how Miss Hailey Bug is doing with her medication. Last week her anxiety was tested on both Wednesday and Thursday when autumn storms rolled through our neck of the woods. They were accompanied by lots and lots of rain. Our yard had huge puddles on it. It was also accompanied by lots of wind. Wind is a bigger anxiety provoker than rain. Wednesday I worked from home and Hailey paced a lot and had trouble settling, but no other anxious responses. Even though it was very stormy overnight, she slept well. Thursday, I had to leave the house late morning. When it was time to go, the wind was very strong. Before I left a branch had come down in the front. I was very nervous leaving her, so I put her in her "hug" (aka Thunder Shirt) and hoped she would be fine for a few hours until the Man was home. A top of a tree came down while she was alone and there was no destruction. We were thrilled. I guess the meds are helping. I had spoken to the vet and he said she needs to stay on her meds for at least 4-6 months and then we can look at reducing the dose. We will think carefully about this because while I don't love her being medicated, I do love the idea that she can cope with extreme fears better. And she is still Hailey. Except for coping with storms better, there is no difference in her behaviour. She is still her crazy, loveable self! This weeks mischief goes to Mr. Phod. On Friday we noticed he was obsessively licking the inside of his right back leg. He licked it so much it was red and he was creating a hot spot. We can't be sure the area wasn't irritated in the bush, but we didn't see any cut or scrap. I knew we had some dog creams that may help relieve the discomfort and get him to stop licking. Cream one had gone mouldy. It was super gross! Cream 2 was fine (fortunately). While he didn't like me putting it on, it seemed to help. Saturday it looked better and he was licking less. We put a warm compress on it to help. Yesterday, the bright red spot was completely gone, although Man did catch him licking it and told him no licking. Phod, while co-operative, doesn't enjoy any type of medical treatment. If he thinks it is coming, he just slowly walks away. When you tell him to stop and he has to, he is unhappy, but doesn't resist. All of this has Phod feeling pretty sorry for himself. This picture was taken after I went to check the spot. Let's hope it is gone for good! Our people left us last night (don't worry, we live in the middle of no where and get no trick-or-treaters) to go trick-or-treating with our human cousin Maggie. 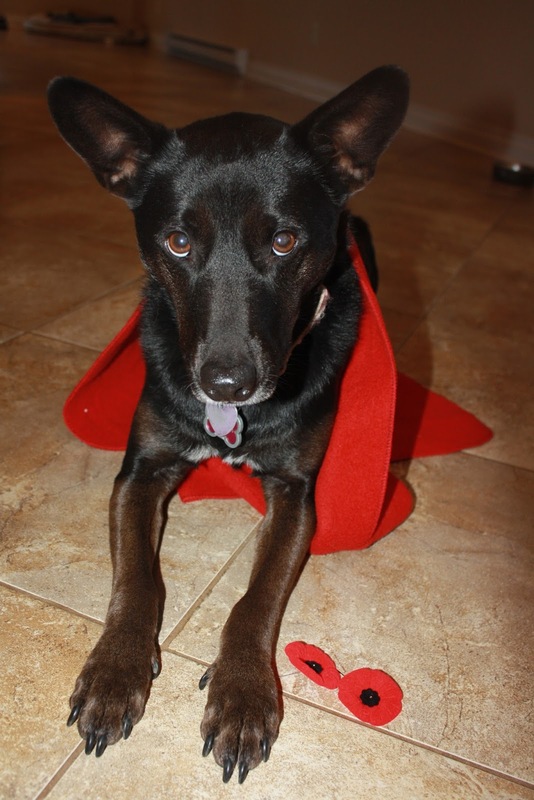 We don't think she looks humiliated enough, even if she got a cookie! Maybe now that they have a co-operative dress up participant, they will leave us alone.